Honors First Seminar Courses. These courses are designed to provide a foundation for students enrolled in the Honors Honors Program. They emphasize the use of primary sources, provide training in thesis development, and emphasize cross-cutting analysis of historical and contemporary issues. 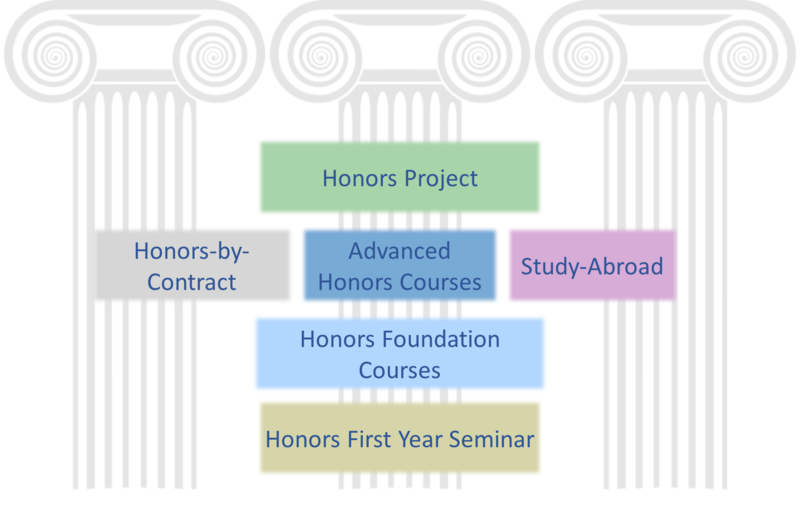 Honors-level foundation courses. These courses are special honors versions of regularly run departmental courses, providing additional depth and focus compared to related non-honors courses. Examples include Principles of Macroeconomics, General Chemistry, and Issues in Philosophy. Upper Level Honors Courses. These course are unique offerings to the honors program– they are often specialized topics with a significant interdisciplinary focus, and may be team-taught or involve a specialized project/experience. Some examples include: Creating and Contesting Sacred Spaces, Art Amongst War: Visual Culture in Afghanistan, and An Odyssey in Ancient Greece (an abroad course that tours Greece and Turkey). Course enhancements. Students who wish to obtain greater depth and scope in non-honors courses may do so through course enhancements. Honors faculty who teach an upper level non-honors course may provide additional opportunities for honors students. A select number of seats normally reserved for majors are reserved for honors students. Examples include: Transnational Feminisms and Photography in India. Honors-by-Contract. Honors students are able to customize the learning outcomes of a non-honors course through Honors-by-Contract. This offering is unique to students enrolled in the Honors program and is well suited to students who have specific scholarly interests, or who are interested in exploring new fields. Students work with the instructor to develop a curriculum plan and a series of course enhancements, which are submitted to the Honors Program coordinator for approval. Students can enroll in up to 2 HBCs as part of their Honors Program curriculum. An example of recent HBC projects includes an original music composition based on the DNA code (Biology Honors student enrolled in a music course on electronic music). Study-Abroad. A few select J-term and Maymester faculty-led programs are Honors courses, but additionally, if you study abroad for an entire semester, one of these courses can count be counted as an Honors course, fulfilling your global requirement. Students should receive approval for study-abroad Honors courses before departing for the study-abroad experience.